Add some autumn color to a porch, patio or other spot in your yard with a fall container. 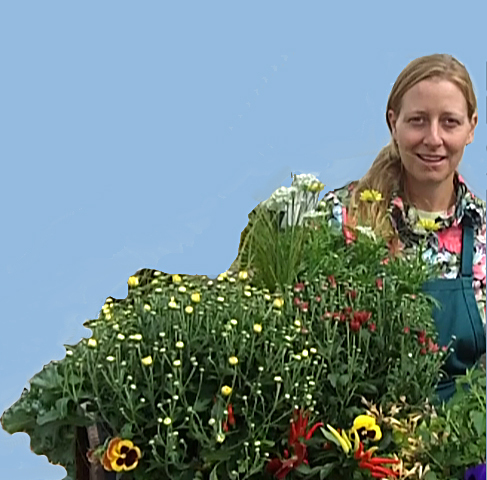 This video demonstration is presented by Colleen Morrissey, herb manager and container designer at Mischler’s Florist and Greenhouses, 118 South Forest Rd. Williamsville. Morrissey starts out by giving suggestions for plants that are frost resistant and should take you into the middle of November. They include annuals, perennials, herbs and grasses. Plants are available now at Mischler’s. She shows you how to put together a very simple and quick planter in traditional autumn colors, then creates a hanging basket in nontraditional colors. Morrissey gives lots of great tips along the way. Next week we’ll bring you another video where Morrissey shows you how to do a larger and more complicated fall container garden. Suggestion: Tease the roots and water soil BEFORE planting. Bobbi, what does “tease the roots” mean? Hi, Bobbi! true true It isn’t shown, but behind the scenes I always prep the soil in bulk, ‘wetting it up’ to minimize dust/help the water molecules adhere, and ‘kneading’ it, to smooth out hard lumps and bumps. I like to work with smooth, slightly damp soil. I water in the assembled planter. Secondly, if any of the starts are rootbound, I will indeed tease the roots, or slice the sides and split open the soil. These babies were pretty fresh still! Thanks! Colleen, thanks so much for that explanation. I loved the non-traditional planter. I’ll have to try that….do you still have the agastache and sage in stock. Last time I went, they were not there. Hi Kirsten, yes, we do have agastache,yellow and purple, and Bergarten Sage, not the purple though.Hope to see you, we are open 8-5 Mon-Fri and 9-5 Saturdays.